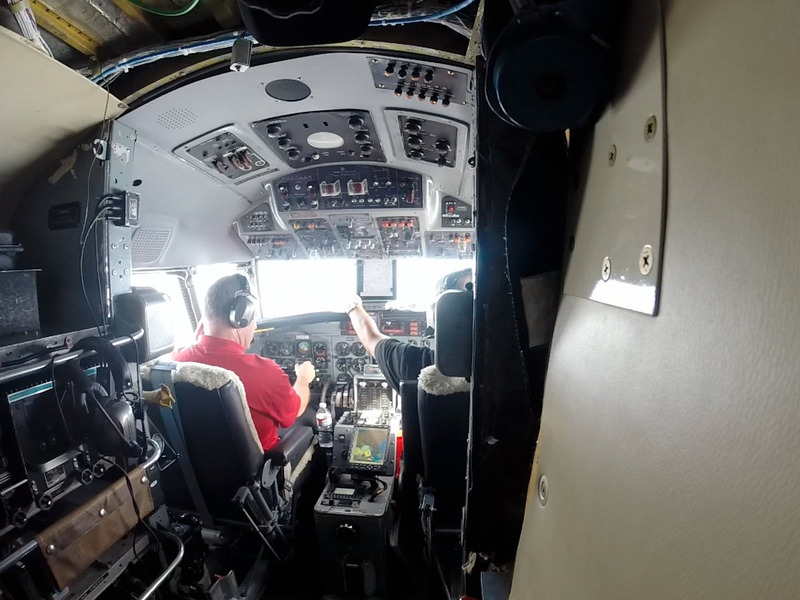 We were setting out to fly straight at a storm to test Honeywell’s new 3D weather radar, but sadly the nearest bad weather was hundreds of miles away. No matter. 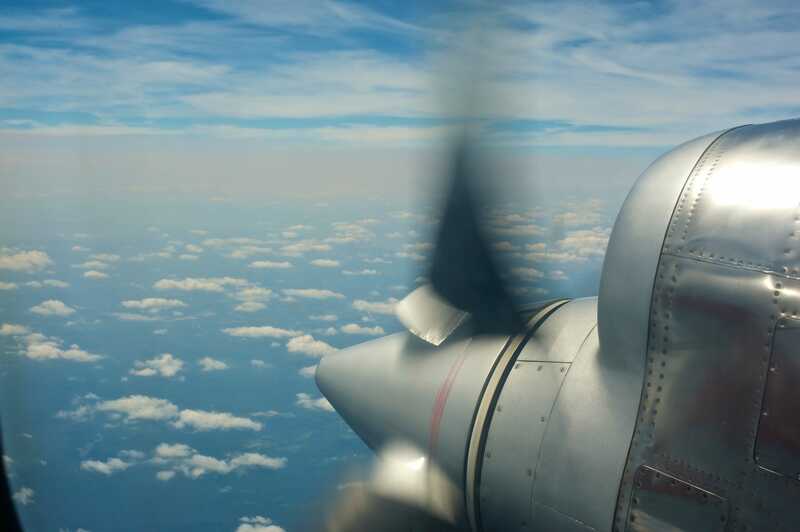 Flying in a 1952 Convair 580 that’s “built like a tank,” we left New York’s LaGuardia Airport and flew toward a storm system in Virginia. Honeywell’s IntuVue 3D weather radar analyses data from 17 different angled “slices” of space at once, showing all of the weather that’s in front of the plane, from the ground all the way to 60,000 feet. Traditional radar systems only look at one slice of space at once, making it hard to know without recalculating the radar if there’s a storm above or below one’s current position. Older systems can also be confused by the curvature of the planet, requiring more calculations and more adjustments from the pilot. The new technology should make planes safer and also reduce weather-related delays, as airlines will be able to fly in bad weather more confidently and plan better routes. Courtesy HoneywellThis visualisation shows the amount of data the radar captures. It can find everything in front of the plane for 320 miles, from the ground up to 60,000 feet. 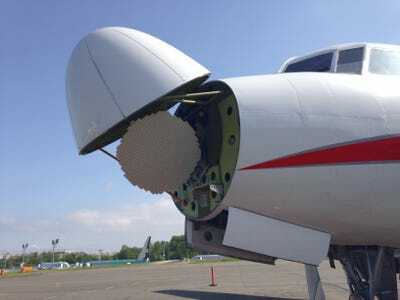 The radar system itself fits into the nose of the plane. Even though it’s a smaller plane, the Convair 580 has a 30-inch space in the nose for the radar, the same size as the space in most 737s and 757s. That’s another reason why it makes a great test aircraft for products that will eventually go in big airliners. Courtesy HoneywellThe IntuVue radar system itself fit into the nose cone of the plane, which just happens to be the same size as the nose cone for lots of 737s and 757s — making this plane an ideal test vehicle. Below, you can see the radar screen itself. It’s right in the center, between all the dials. 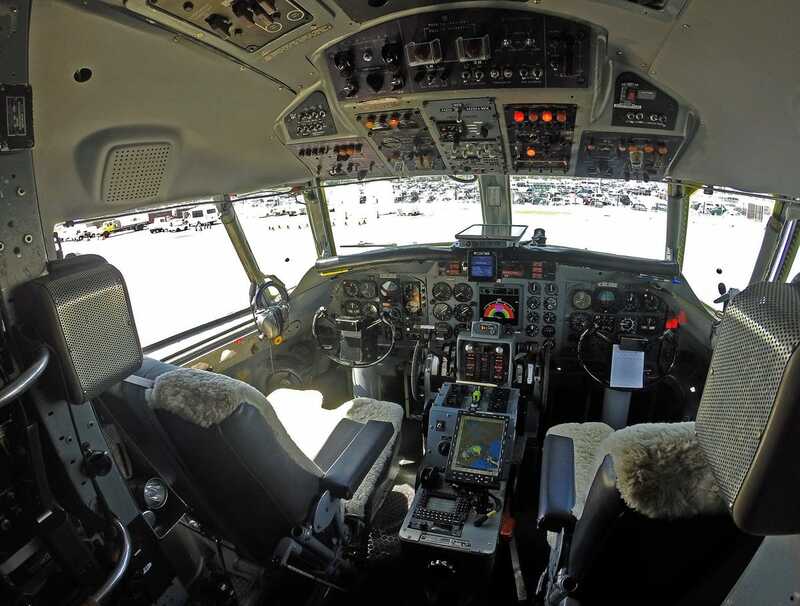 The system sees a full 180 degree view of what’s in front of the plane, including weather systems above and below the current altitude. Kevin Loria/Business InsiderFrom the cockpit, you can see the radar right in the center, between the two seats and a whole lot of dials. 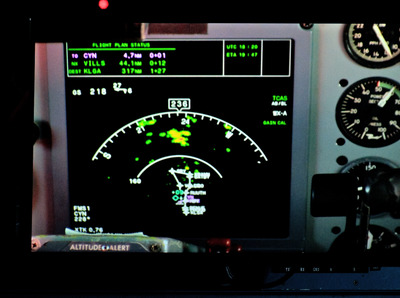 Along with the radar there was a small tablet in the cockpit that tracks National Weather Service data. 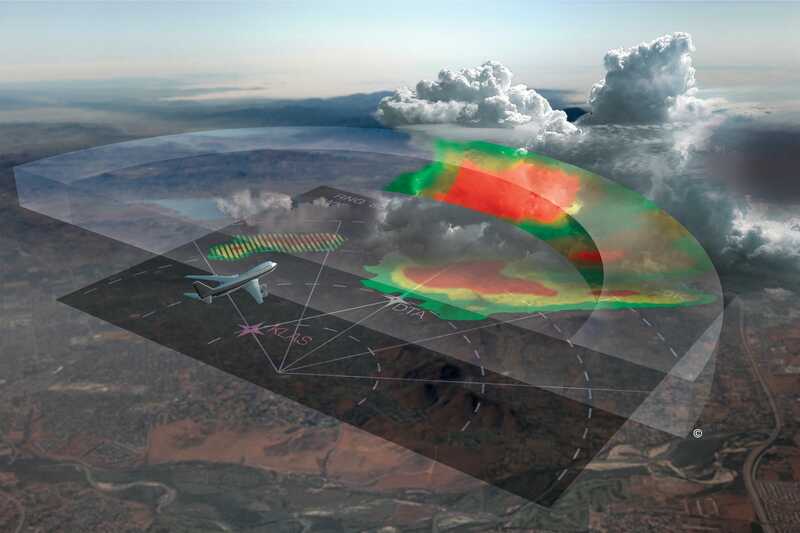 Honeywell coordinates its weather research with NWS, NASA, the EU, and other partners. Kevin Loria/Business InsiderYet, photos from within the plane reveal more about the airport itself than external shots of the plane would have. Onboard, we had headsets at our seats that we could use to chat with each other during takeoff and landing. I got to hear what happens when someone forgets to put their phones in aeroplane mode. You get to hear that static sound that sometimes pops into speakers when a phone is looking for service. 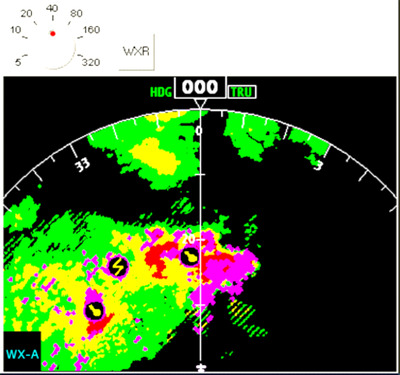 Below is an example of what the radar looks like in action. In this example, provided by Honeywell, it shows a serious storm.Darker colours mean more intense weather, and little icons predict where hail and lightning will be found. Courtesy HoneywellTime to change this flight path, perhaps. As for our flight, all we had was a fairly small and distant storm system, and we only got within about 80 miles of the weather itself. Normally planes try to miss a storm by 20 miles or more, so we were in a very safe spot and unfortunately had to turn around before getting any closer. Kevin Loria/Business InsiderThis is what we saw on monitors that showed the pilot’s view of storm. This is what it looked like outside. We still had clear skies for the most part. 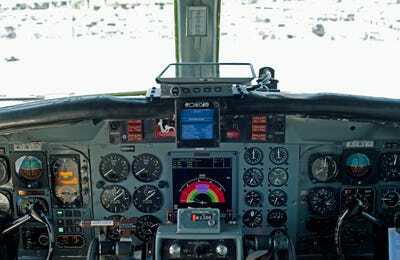 Honeywell had changed the engines on the Convair for C-130 turboprop engines, which are better able to fly through storms when needed. Kevin Loria/Business InsiderHoneywell replaced the engines on the Convair 580 with these C-130 turboprop engines, since they’re sturdier. Pretty cool. 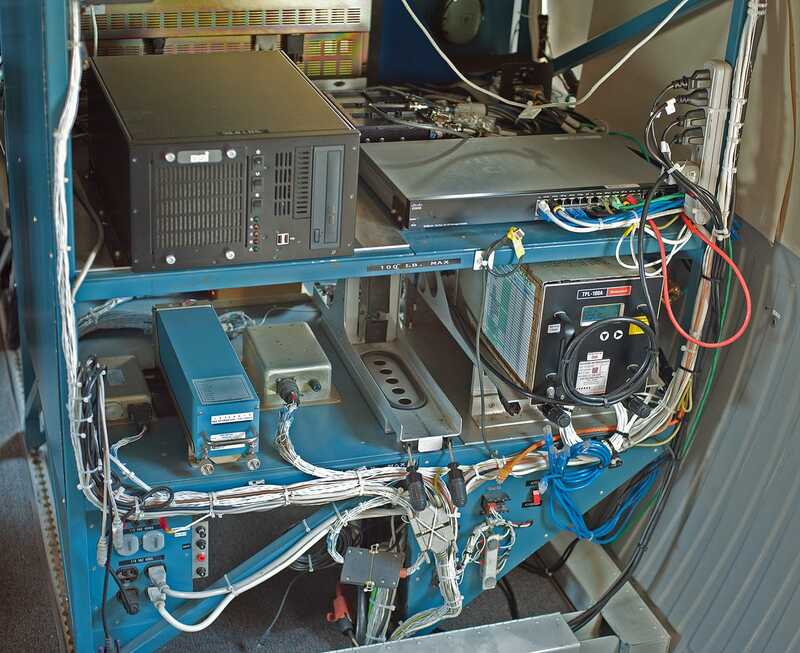 And in the interior of the plane, all the wires connected to all the test equipment were on display. Kevin Loria/Business InsiderThe plane was full of wires and different technology that they use this plane to test. Kevin Loria/Business InsiderThe cockpit itself stayed pretty bright as we made our return to New York.